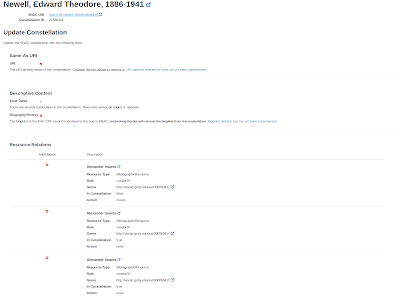 After 2-3 weeks of work, I have made some very significant updates to xEAC, one which paves the way to making archival materials at the American Numismatic Society (and other potential users of our open source software frameworks) broadly accessible to other researchers. This is especially important for us, since we are a small archive with unique materials that don't reach a general historical audience, and we are now able to fulfill one of the potentialities we outlined in our Mellon-NEH Open Humanities Book project: that we would be able to make 200+ open ebooks available through Social Networks and Archival Context (SNAC). I have introduced a new feature that interacts with the SNAC JSON API within the XForms backend of xEAC (note that you need to use an XForms 2.0 compliant processor for xEAC in order to make use of JSON data). The feature will create a new constellation if none exists or supplement existing constellations with data from the local EAC-CPF record. While the full range of EAC-CPF components is supported by the SNAC API, I have focused primarily on the integration of the stable URI for the entity in the local authority system (e.g., http://numismatics.org/authority/newell), existDates (if they are not already in the constellation), and the biogHist. Importantly, if xEAC users have opted to connect to a SPARQL endpoint that also contains archival or libraries materials, these related resources will be created in SNAC and linked to the constellation. It should be noted that this system is still in beta and has only been tested with the SNAC development server. There is still work to do with improving the authentication handshake between xEAC and SNAC. The first step of the process is executed when the user loads the form. If the EAC-CPF record already contains an entityId that conforms to the permanent, stable SNAC ARK URI, a "read" query will be issued to the SNAC API in order to determine what content already exists in the constellation, including what resources are already available in the constellation vs. the resources extracted from the local archival information system via SPARQL. 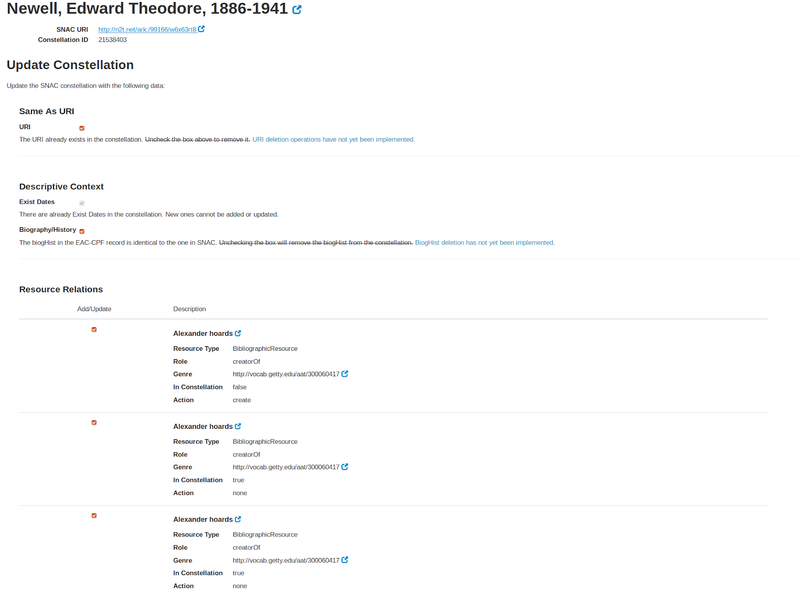 I recently made an update to our Digital Library and Archival software so that every different type of resource (ebooks and notebooks in TEI, photographs in MODS, finding aids in EAD) will include a dcterms:type linking to a Getty AAT URI in the RDF serialization. This AAT URI, in conjunction with the rdf:type of the archival or library object (often a schema.org Class), will help determine the type of resource according to SNAC's own parameters (BibliographicResource, ArchivalResource, DigitalArchivalRescource). Additionally, the role of the entity with respect to the resource (dcterms:creator, dcterms:subject) informs the role within the SNAC resource-constellation connection: creatorOf, referencedIn. Abstracts and extents are inserted, if available. SNAC uses Google user tokens for validation within its own system. There is currently no handshake available between xEAC and SNAC which will facilitate multiple users in xEAC to each have their own credentials in SNAC. At the moment, the "user" information is stored in the xEAC config file. A user will have to enter their Google credentials from the SNAC API Key page into the web form and click the "Confirm User Data" button. xEAC will submit an "edit" to a random constellation to verify the validity of the authentication information. If it is successful, the credentials are then stored back into the config (although the token only lasts about 24 hours) and the constellation is immediately unlocked. The user will then proceed to the create/update constellation interface. Same As URI: The URI of the entity in the local authority system will be added into the constellation. This is especially important or establishing concordances between different vocabulary systems. Exist dates can be added into the constellation if they are not already present. If there isn't already a biogHist in the constellation and there is one present in the EAC-CPF record, the biogHist will be escaped and published to SNAC. A source will also be created in the constellation in order to link the new biogHist to SNAC control metadata, tying the new biogHist directly to the local URI for the authority. This makes it possible to update or delete only the biogHist associated with your own entity without overwriting other biogHist information that might already be present within the constellation. While SNAC does support multiple biogHists, only the most recently added biogHist will appear in the HTML view of the entity. For this reason (at present), xEAC will only insert a biogHist if there isn't one in the constellation already. In step 1, if the constellation already contains a biogHist associated with the source URI for your authority, it will hash encode the constellation's biogHist and compare it to the hash-encoded biogHist currently in the EAC-CPF record. If there is a difference between these hashes, the constellation will be updated with the current version of the biogHist in the EAC-CPF record. A list of resource relations derived from SPARQL will be displayed. All will be checked by default in order to first create the resource with the "insert_resource" API command, and second to connect the constellation to that newly created resource with "update_constellation". Each resource entry will display some basic metadata and whether or not it already exists in the constellation, and what action will be taken. It is possible to uncheck the box for a resource that exists in the constellation to remove it from the constellation. After the successful issuing of "publish_constellation" to the SNAC API, an entityId with the new SNAC ARK URI will be inserted into the EAC-CPF record, if the constellation is newly created (updates presume the ARK already exists in the EAC record). Saving the EAC record will trigger a re-indexing of the document to Solr and a SPARQL/Update that will insert the ARK as a skos:exactMatch into the concept object for the entity. The data above are those I consider to most vital to SNAC integration--essential historical or biographical context and related archival or library resources that can be made more broadly accessible. I am not sure how many other authority systems are able to interact with SNAC with this degree of granularity yet, but I am hopeful that these features will propel more unique research materials into the public sphere. I will briefly touch on these new features when I present our our comprehensive LOD-oriented numismatic research platform at SAA next month (I will upload the slideshow soon).